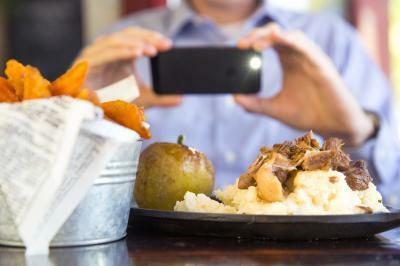 If you want to enjoy your food, stop taking pictures of it and putting them on the Internet, say marketing scholars. They mean you, foodies on Instagram and Pinterest. It could be ruining your appetite by making you feel like you've already experienced eating that food. Marketing experts at Brigham Young and University of Minnesota have concluded that what happens is the over-exposure to food imagery increases people's satiation. Satiation is defined as the drop in enjoyment with repeated consumption. Or, in other words, the fifth bite of cake or the fourth hour of playing a video game are both less enjoyable than the first. Is this a new weight loss program? Will 'Photograph Your Way To A Healthier You' be in bookstores and on the Dr. Oz show by January of 2013? To examine this food-photo phenomenon, they recruited 232 college students (naturally) to look at and rate pictures of food. In one of their studies, half of the participants viewed 60 pictures of sweet foods like cake, truffles and chocolates, while the other half looked at 60 pictures of salt foods such as chips, pretzels and French fries. After rating each picture based on how appetizing that food appeared, each participant finished the experiment by eating peanuts, a salty food. Participants then rated how much they enjoyed eating the peanuts. In the end, the people who had looked at the salty foods ended up enjoying the peanuts less, even though they never looked at peanuts, just at other salty foods. The researchers say the subjects satiated on the specific sensory experience of saltiness. 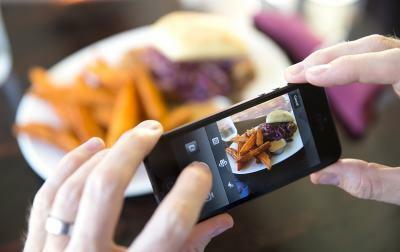 "If you want to enjoy your food consumption experience, avoid looking at too many pictures of food," said lead author Jeffrey Larson, a marketing professor at Brigham Young University. "Even I felt a little sick to my stomach during the study after looking at all the sweet pictures we had." Then again, Larson said, if you have a weakness for a certain unhealthy food, say, chocolate, and want to prevent yourself from enjoying it, you may want to look at more pictures of that food. The authors said the effect is strongest the more pictures one views. Thus, if you've only got a few friends who post food pics on your social media feed, you're probably OK to keep following them. "You do have to look at a decent number of pictures to get these effects," said senior author Ryan Elder, also of Brigham Young. "It's not like if you look at something two or three times you'll get that satiated effect." That's good news for food-photo enthusiasts, because, let's be honest, showing everyone the awesome food you're eating is really cool.